The St Colmcilles Gaelic Athletics Club’s Annual General Meeting will take place at 3pm on Sunday the 25th February in the St Albans Irish Club – Official. If you are interested in getting involved in this great club and helping to grow the club in the future, please try to come along to the meeting to express an interest and have your voice heard. There are positions free on the committee that we will be looking to appoint on the day and we always welcome new committee members. Hope to see you all there. Colmcilles Abú! St. Colmcilles will be hosting an End of Year Presentation Event for our Youth teams. 2017 has been a fantastic year for all our youth teams and we want to get everyone together to celebrate and recognise these achievements and the hard work that all of our young players, as well as their parents and coaches, have put in all season. There will be a Gaelic Football Blitz for the Under 8s & Under 10s starting at 2.30pm. This will be followed by the presentation of awards for all Youth teams including medals and certificates. There will also be food and drink and some music in the Irish Club. We hope that you can come and make it a great day to celebrate. It was an amazing night for St Colmcilles GAC at the 2017 Active St Albans City & District Sports Awards Ceremony last night. In 2016, the club won the Community Project of the Year Award for the Gaelic 4 Girls initiative which started our Under 14s Girls team and this time we had received 4 nominations for this year’s awards. Neil Gallagher was nominated for Male Coach of the Year for his work with the Under 12s team and the Under 14s and 16s girls’ teams. Both the men’s and ladies’ senior teams were each nominated for the Sports Team of the Year Award and St. Colmcilles, as a whole, was nominated for the Community Club of the Year Award. The club won the Community Club of the Year Award and received Recognition Awards for the other nominations. This is a fantastic achievement and something that we all, as players, coaches, members, parents and supporters, should be very proud of. Thank you to everyone who makes our club great. Well done all!! Day 3 of the St. Colmcilles Cúl Camp was great fun once again with everyone enjoying the day as the camp drew to a close for 2017. Well done to all the kids who took part in the camp and made it the great success that it was. The club have to say a massive ‘Thank you’ to all coaches from both the men’s and the ladies’ senior teams who helped out over the 3 days. John O’Dowd, Daithi Breen, Odhrán Gallagher, Thomas Patrick Kieran Maloney, Bob Canty, Kevin Devlin and especially Naomh Ní Mhongáin were fantastic in running the Cúl Camp, ensuring that all the kids had a great time and got the most from the 3 days. Also a big ‘thank you’ to Rory Norris and Naomh for organising the camp and making sure it was a brilliant success. 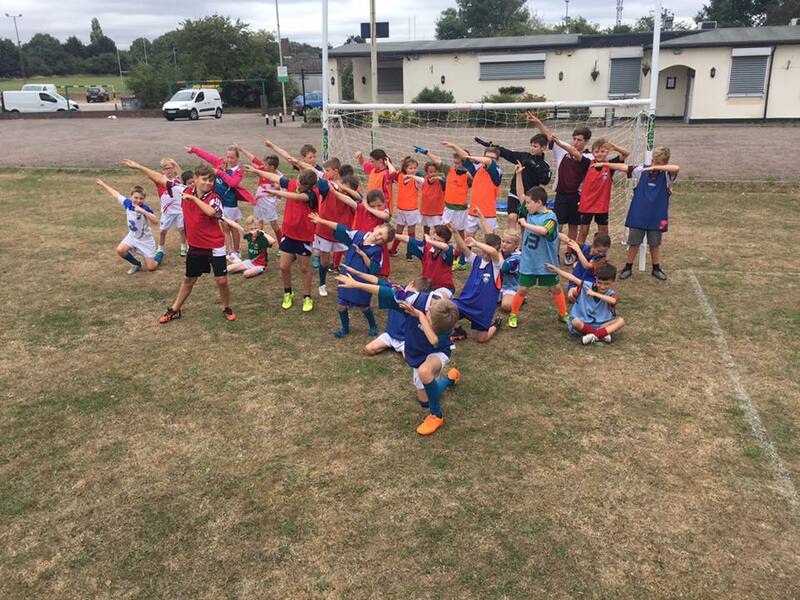 There are still a few more weeks left in the underage season with Wednesday trainings at the club, a few blitz competitions and finishing with the St. Colmcilles Blitz and the Underage Presentation Evening on the 30th September at the St Albans Irish Club – Official. More information to come on this evening soon. 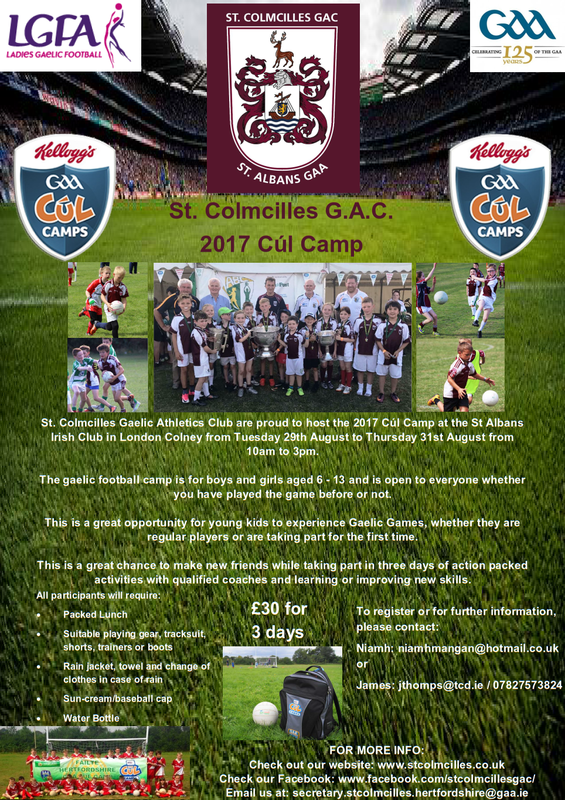 The dates have been set for this year’s St. Colmcilles Cúl Camps. This is a great opportunity for young kids to experience Gaelic Games, whether they are regular players or are taking part for the first time. It is a great chance to meet new people while taking part in three days of action packed activities with qualified coaches and learning or improving new skills. Day 2 of the St. Colmcilles Cúl Camp was exposed to the elements but, the rain didn’t dampen the spirits and all the kids (and the helpers) had loads of fun once again. Coaches from both the men’s and the ladies’ senior teams were there again teaching the kids and helping them to have a great time. A quote from one coach: “Safe to say, the future of the club is in good hands with these lot”. The final day of the Cúl Camp is today from 10am to 3pm. It’s not too late to come down and join in. The St. Colmcilles Cúl Camp is underway. Day 1 of the Cúl Camp was a fantastic success and it was great to see everyone enjoying themselves, learning new skills, having fun and making new friends. The weather was fantastic yesterday so lets hope that it continues to be today. There were plenty of coaches from both the men’s and the ladies’ senior teams down helping out and they helped all the kids to enjoy playing football and ensured that they had a great time. It’s not too late to come down and join in. The Cúl Camp continues today from 10am to 3pm before it concludes tomorrow afternoon. Please contact Niamh or James on the contact details above. 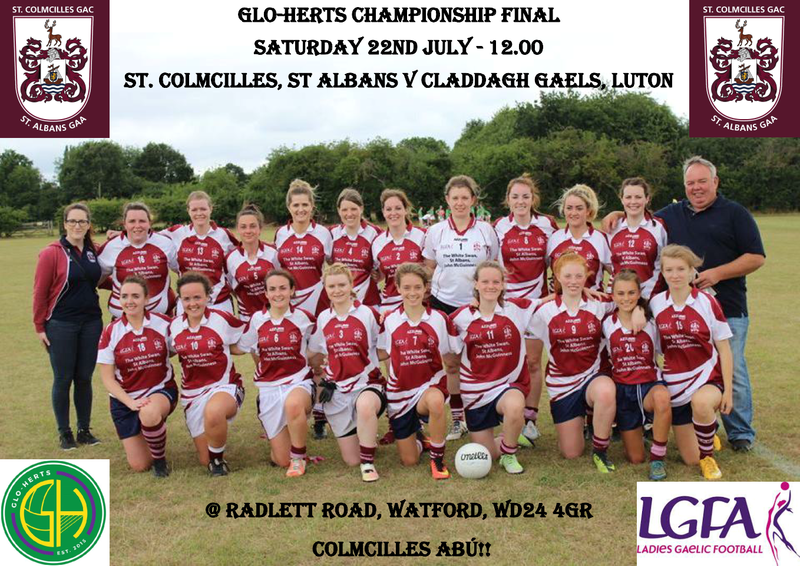 The Glo-Herts LGFA Championship Final takes place this Saturday at mid-day in Watford. The St Colmcilles Ladies Gaelic Football Team take on Claddagh Gaels Lgfc in what promises to be a thrilling game of football. The teams have met twice already this year in tight, highly competitive matches so this should be another great display of ladies football. Come down and support the Sinners as they look to retain the Kathleen Barrett Championship Cup. The annual year 4/5 primary schools tournament took place on Friday 26th May in Cotlandswick, St Albans. There were 20 teams, 55 games across 5 pitches with 360 children participating, the majority of which were playing Gaelic Football for the very first time. The teamwork, sportsmanship and all round play was excellent. Well done everyone and thanks to schools, teachers, parents and of course the participants, who were excellent on the day, for supporting the event. Special mention to the club coaching officers who put in a huge effort to make the day possible. A couple of videos with coverage of the day has been created and can be seen below. Credit to MQ Video for putting these together for the county. Thanks Mark! One of our St Colmcilles families is raising money for a great cause. On Sunday 21st May we are running a fundraiser for Shay and his family. Shay is a 10 year old boy who is part of the St. Colmcilles Gaelic football community here in St Albans. Shay, unfortunately, was diagnosed with a terminal mitochondrial disease which he has been battling for a number of years. There are only a handful of kids with this syndrome who have survived beyond 5 and the oldest surviving kid made it to 14. He has shared a bedroom with his parents for most of his life and they are currently raising money to build a palliative care bedroom for him so he can spend less time in hospital. Shay’s fundraiser will be a family fun day on Sunday 21st May from 11am to 4pm at Oaklands College, St Albans. There will be live music, BBQ, bar, Gaelic football tournaments, beat the goalie and loads to do for the kids with train rides, inflatables, face painting and much more. Lets all get behind the fundraiser on the 21st May. Any help or donations would be greatly received. You can find more information about this great cause here.